Combine the flour, cake flour and salt in a large bowl. Add the butter and use two knives or a pastry blender to cut it into the dry ingredients until the butter is the size of small peas. Add the cold water and mix until it comes together into a ball. It's okay if it's a little crumbly. Shape into a disk, cover with plastic wrap and chill in the fridge for at least 2 hours and up to 5 days. Preheat oven to 350 degrees F. Line a round 9-inch x 2-inch cake pan with parchment paper (see Notes). On a lightly floured surface, roll out the pie crust into an approximate 12-inch circle. Transfer to the prepared cake pan. Trim edges to 2 inches and tuck into the pan. Place a well greased sheet of parchment paper directly on top of the surface of the crust. Fill with pie weights or dried beans or uncooked rice, making sure it's filled all the way to the top of the pan. Bake for 20 minutes, or until crust is barely set. Remove the top piece of parchment and weights and bake until just barely golden brown, about 20 additional minutes. Let cool completely. Increase oven temperature to 450 degrees F. Toss the brussels sprouts with the olive oil and spread evenly on a sheet pan. Place in the oven and roast until brussels sprouts are golden and slightly tender, about 20 minutes. Let them cool for about 5 minutes. Decrease oven temperature to 325 degrees F.
Whisk together the milk, cream, eggs, yolks, salt, pepper and nutmeg. Stir in the brussels sprouts. Sprinkle half of the cheese in the bottom of the crust. Pour the egg mixture on top, filling it all the way to the top (see Notes). Sprinkle the remaining cheese on top. Bake until quiche is set when jiggled and the top is browned slightly, about 1 hour. 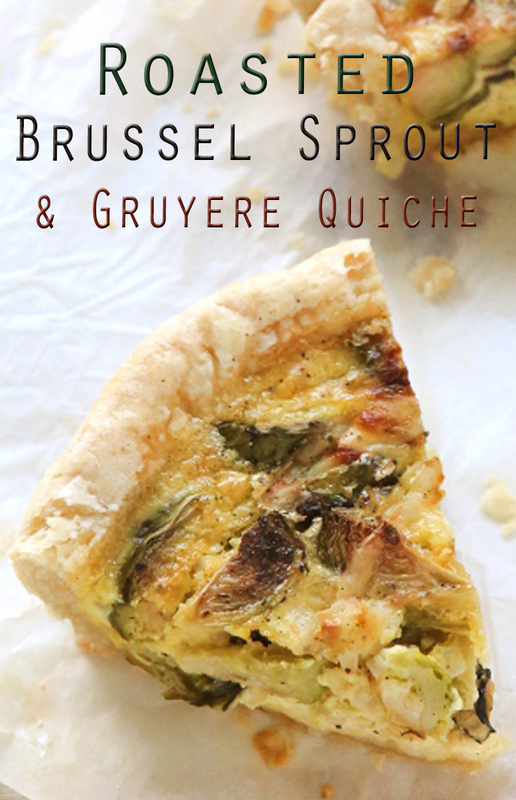 Let quiche cool at room temperature for about an hour before serving if possible. Store leftovers in the fridge. You can also use a 9-inch pie pan. No need to line with parchment paper. Depending on you pan and crust, you could have slightly more filling than will fit. Do not overfill the crust, discard any leftovers.